Based on all the online buzz and the reactions in the theater I was in Friday night, audiences are more than ready for an all out super hero comedy that does not star Chris Pratt or Ryan Reynolds. Thor : Ragnorak picks up with Thor (Chris Hemsworth) returning home to Asgard to deal with his ever present dysfunctional family issues. In a fast moving set up, he exposes Loki (Tom Hiddleston) as a fraud and with the help of Dr. Strange (Benedict Cumberbatch) finds out the fate of his father, Odin (Anthony Hopkins). Then Boom! him and Loki meet Hela (Cate Blanchett), a long forgotten sister, who is brimming over with daddy issues and has the power to prove it. After a knock down, drag out family reunion Thor ends up far, far away as a prisoner on a planet completely under the control of the Grandmaster (Jeff Goldblum). He finds not only Loki weaseling his way into the Grandmaster's good graces but also his Avenger's teammate Hulk with no Bruce Banner to be found. He's Hulk 24/7. For the amusement of the Grandmaster and his flock of admirers (ok that would be his word - they are probably more like prisoners) Thor is forced to fight Hulk in space age gladiator like combat. This section of the movie is where director Taiki Waititi's touches really jump off the screen. The scenery is an overload of colors and exotic characters and the humor, both physical and verbal, flows freely. We do have some unresolved plot lines so Thor, Loki and Hulk eventually get back to Asgard and with the help of a rouge Valkyrie take on Hela. 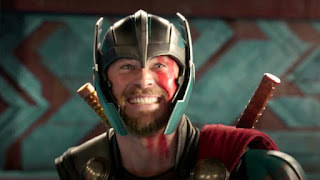 Thor does get his mojo back and the resulting battle scenes are electrifying (pun intended). Do I have problems with this movie. Yes, that is who I am. I feel like the humor goes a step too far at times and I may have been laughing on the outside but inside I was cringing. There are short scenes that if lifted out of the film could fit right in as one of those spoofs they play before the MTV Movie Awards. Second, let's talk about Cate Blanchett. She is fantastic as the smack talking but clearly damaged Hela. I think she is underused though. I can see why since the bulk of the movie's fun is happening when Thor is away from Asgard. During that time we get some ok scenes of Hela slinking around, throwing out decent one liners and menacing the Renaissance Fair clad residents of Asgard.... but I felt at any minute she might break the fourth wall and say "Hey, remember me. 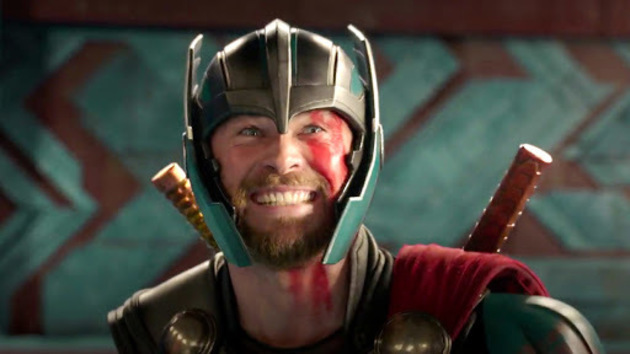 I'm still here"
To sum it all up, Thor is left a much different character than he has been before with a very uncertain future. I don't think there is going to be a fourth Thor movie; so I guess we will see how things go for him in the next Marvel shared universe flick - Avengers: Infinity War. Enjoyed your review, and I agree with you about the humor and underusage of Cate Blanchett. However, I really enjoyed the movie, and felt it was a nice change from the “darker” tone of the prior Thor movies.